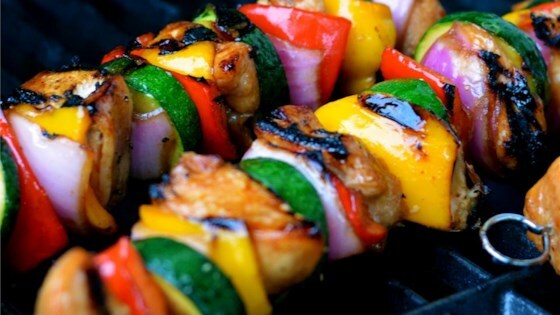 "Honey chicken kabobs with veggies. You can marinate overnight and make these kabobs for an outdoor barbecue as a tasty alternative to the usual barbecue fare! Fresh mushrooms and cherry tomatoes can also be used. (This can also be done in the broiler.)" See how to grill sweet and savory chicken and veggie kabobs.